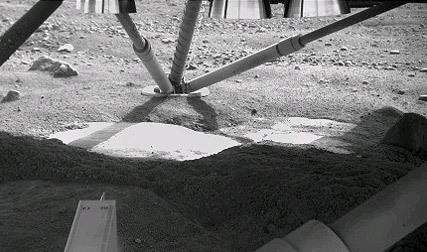 The Mars Phoenix Lander has found direct photographic evidence of ice near the surface of Mars. It was uncertain whether the white material found when it dug a trench was ice, salts, or some other mineral, but it managed to take photographs of some of the white material disappearing. This could only be due to the white material subliming, which most probably means that it's ice. Continue reading "Evaporating ice on Mars"
Has the Mars Phoenix Lander uncovered ice that was buried under the soil? 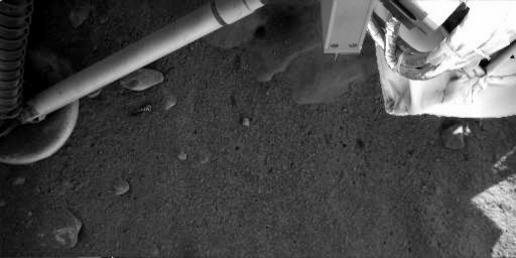 While the blast from its thrusters when it landed may have uncovered ice, it's not reachable by the robotic arm. In a trench dug up by the arm last week, named "Dodo-Goldilocks", the lander may have uncovered ice, which is much more obvious in a color picture than in a black and white photograph. Seeing white on a planet whose most popular color is red is a nice change. Continue reading "Ice or salt?"